How much violence and damage was inflicted on the German Jewish community and the Austrian Jewish community in the Kristallnacht pogrom? During Kristallnacht, the damage to Jewish property and violence against Jews were far less than historians have suggested, both in the number of assaults and in the overall death toll. David Irving and Ingrid Weckert, for example, are two Holocaust deniers that minimize Kristallnacht’s impact on German Jewry and Austrian Jewry. Irving claims that “. . . about 7,500 of the one hundred thousand shops had their windows smashed.” Similarly, Weckert calls the reports about the extent and nature of the damages “highly exaggerated.” She cites 171 synagogues destroyed, 7,500 stores damaged, and only three dead. Evidence shows that the destruction and violence associated with Kristallnacht was much greater than Holocaust deniers claim. This can be demonstrated in multiple ways: the number of Jewish businesses and synagogues destroyed, the vast destruction of personal Jewish property, and the number of Jews assaulted and murdered. Holocaust deniers downplay Kristallnacht’s impact in an attempt to minimize Jewish suffering at the hands of the Nazis. In the quote above, Holocaust denier David Irving purposefully trivializes the actual damage done to Jewish shops by inferring that only their windows were smashed. 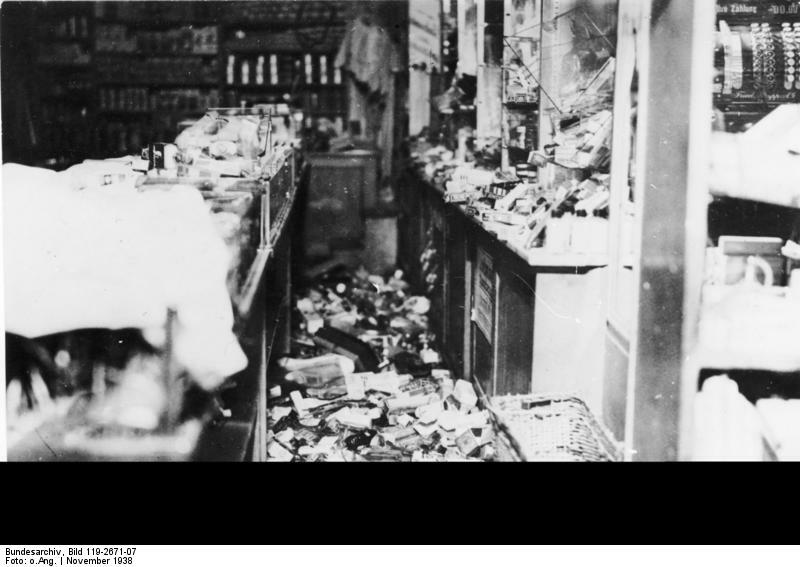 However, even the Nazis themselves noted that many Jewish shops and businesses had been totally destroyed, not lightly damaged. It is well documented that looting was rampant and most Jewish-owned business still in operation never recovered financially from this mass theft and destruction. Likewise, Irving claims that there were 100,000 Jewish shops in Germany at the time of the Kristallnacht pogrom. Realistically, by November 1938 most Jewish businesses had been ‘Aryanized’; that is, most Jewish-owned businesses had been forcibly sold to Germans. The Nazis made Jews sell their businesses far below actual value. This process of legalized theft meant that only about 9,000 businesses were still owned by Jews at the time of Kristallnacht. Irving’s starting figure of 100,000 Jewish businesses would mean that 7.5 percent of Jewish businesses were damaged or destroyed. However, 7,500 destroyed businesses out of 9,000 constitutes a staggering 84 percent of Jewish-owned businesses that were damaged or destroyed. Irving also states that, “Thirty-six of the country’s half-million Jews had been murdered…” In fact, at least 91 Jews were murdered and the final total was undeniably more since an unknown number of Jews arrested during Kristallnacht died in detention. Other deadly effects also emerged as a result of the violence. In Vienna alone, there were 680 suicides in the wake of the pogrom. Such suicide figures should be included when considering the impact of Kristallnacht on the German Jewish community and the Austrian Jewish community. In terms of the damage done to communal life, Irving also claims that “…191 of the country’s fourteen hundred synagogues had been destroyed…” Contrary to his figures, the Germans themselves estimated on November 11, 1938 that at least 267 synagogues had been set ablaze or smashed during the program. Other estimates of destroyed synagogues are even higher. It is possible that as many as 520 synagogues were completely or partially destroyed. One historian, A. Diamant, estimates that some 1,200 of approximately 1,800 synagogues and prayer halls were destroyed. Regardless of the exact number, it is clear that Irving’s figure of 191 destroyed synagogues is far too low. The evidence shows that Jews did not exaggerate the number of deaths, assaults, and property damage during Kristallnacht. Facts do not support the attempts of Holocaust deniers, like Irving and Weckert, to minimize the suffering and damage. Modern research shows that almost 85 percent of the remaining Jewish businesses were destroyed, at least 91 Jews were murdered, and many others died after being arrested, whether in detention or concentration camps. The Germans themselves noted that 267 synagogues were destroyed, though the number could be significantly higher. David Irving, Goebbels: Mastermind of the Third Reich (Focal Point, 1996), p. 495. This entire book can be downloaded as a PDF at http://www.fpp.co.uk/books/Goebbels/. Ingrid Weckert, Flash Point: Kristallnacht 1938: Instigators, Victims and Beneficiaries (Institute for Historical Review, 1991), p. 107. Richard J. Evans, David Irving, Hitler and Holocaust Denial, Section (4)(4.3)(c)(iv)(6) at www.hdot.org. Richard J. Evans, David Irving, Hitler and Holocaust Denial, Section (4)(4.3)(c)(iv)(7). David Irving, Goebbels: Mastermind of the Third Reich (Focal Point, 1996), p. 495. Richard J. Evans, David Irving, Hitler and Holocaust Denial, Section (4)(4.3)(c)(iv)(8).